Due to a death in the family of Matt Epperson, this concert has been rescheduled from July 1 to July 8. 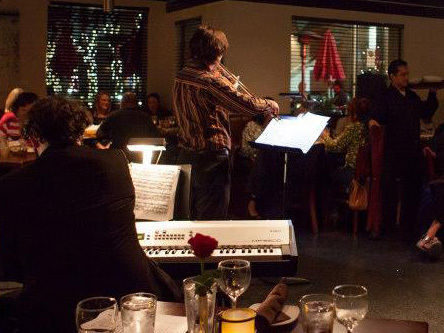 The artistry of high quality professional classical musicians up close in an intimate and romantic setting. This concert features two significant works that benefited from second looks. Johannes Brahms wrote his Piano Trio No. 1 when he was just 20 years old, and it became a significant success for him when published a year later. It was his first published piece of instrumental music not for solo piano. Nevertheless, Brahms took a second look at the piece 35 years later, and reworked it significantly with the experience of a lifetime of accomplishments. It is considered one of the greatest piano trios ever written. Rebecca Clarke’s Viola Sonata tied for first place in a 1919 chamber music competition when she was 33 years old. Clarke's identity as a woman was hidden from the committee, and caused a sensation when revealed. Although an immediate success, the Sonata gradually disappeared from the repertoire, likely because Clarke herself went long periods in her life without composing. The Viola Sonata and her music was rediscovered in 1976, it has become one of the most frequently performed large work for viola and piano since then. In addition, Travis McGuire, a bass vocalist with a big voice and comedic flair will provide an entertaining interlude between these two instrumental master works.